While I know that getting “outside of my comfort zone” is a fine way to challenge myself into trying something new, so much of this past year I’ve spent finding and curating my “comfort zone” through making our house into a space that I’m eager to come home to every evening (and hate to leave every morning). It’s certainly no coincidence that my most-used hashtag on social media is #theresnoplacelikehome, because it’s really true for me, at this stage of my life. Music playing, usually our favorite radio station, KJaZZ, but also a good amount of vinyl or European pop music as well. Kitties who race to the door to meet me whenever I cross the hearth. Two fireplaces that we use every night in winter–it is so hard to top the coziness of a glowing hearth on a winter night. My office, for “getting things done.” This space helps me to be perfectly productive because it has everything I need (and want) at hand and I am rarely interrupted when I’m working there. Houseplants that make my heart sing, each one carefully selected for shape/color/texture. I not only talk to my plants all of the time, but I also give them a weekly leaf massage. The cosiest-imaginable bed, with the plushest flannel winter sheets (I first experienced these sheets in an AirBnb and had to go right out and get my own set). We also recently upgraded to a Casper mattress and pillows, which are pure comfort and make my back and neck so happy. What is on your happy-comfort zone list? I wasn’t last place and I did cut someone else off around a turn but it wasn’t intentional (I apologized even as he cursed me). I came in 3rd in my division (Masters) and smack-dab in the middle of the pack of racers. Perhaps my brightest moment during the race was in the last third where everyone else was obviously tired out, but I got my second wind. I was right between two other women on canoes and I realized that being the middle I was going to get sandwiched and I considered putting my paddle into the water to stop my boat from being squeezed and let them go ahead. But instead I turned on my power, paddled super-hard for about 45 seconds and zoomed between and past both of them. That felt pretty good. *hats off to my Offshore teammates Mark and Bob who helped with transporting my boat to the race, too! I know there’s been a lot of research showing that completely open office plans can disrupt attention. However, it can also contribute to an ethos of collaboration and openness, which is what I’m seeking to create in this new space. In our division we are working to bring people into the space to experiment with technology, and want to reinforce the ideas of visibility and creativity. I believe this open-office concept is a very visual and impactful way to send that message. Was happiness so bound up with the knowledge that it was also ephemeral? And was it therefore always to be accompanied by the stubborn fear of its loss? Something wasn’t right. And yet she believed that she had developed an unusual capacity to ruin her own good fortune with this anxiety, this expectation of something going wrong. This was one moment in the book that resonated with me on a fairly deep level. I was raised on the notion that one could not know happiness without also knowing a corresponding sadness, and it seems to me that every happy moment in my life has held the shadow of the days where things have been equally awful. I love how Bausch is able to capture that so well in this quotation. It happens in a moment where the protagonist has no idea that there is a huge amount of sadness in her future, it’s a foreshadowing of what’s to come. But of course life is not as tidily constructed as a novel and I wonder if it isn’t possible just to be happy for awhile, without it inevitably leading to a time of despair? Yesterday I made this pumpkin bread recipe from Smitten Kitchen and it was every bit as magical as Deb said it would be: crunchy sweet top (who knew that this was what pumpkin bread needed to be really special), thick dense cakey center, not at all too sweet. It made the perfect addition to my breakfast this morning! I am more than a little bit obsessed with letters. Ever since I was a young girl I have been a prolific writer of letters, often spending hours every Sunday writing to friends and family members, loving the practice of telling the stories of my life and sending little thoughts out through the post. In fact, I used to keep a large stash of little things that I collected from magazines and newspapers, just to have fun little things to include in the letters that I was writing. One of my greatest treasures is the address book that I kept for years, where I would record all of the places where my correspondents lived. Even though I no longer add to that book, I still keep it because of the waves of memories that it holds as I look at where each of my friends moved over the years. And my love of letters even overlaps with my love of books. Three of my all-time favorites are Angle of Repose (which includes letters as part of the narrative), Pamela (an entirely epistolary novel) and Letters from Africa (the real-life letters of Karen Blixen to her beloved Denys Finch-Hatton). This is also why I am so very delighted by the current novel that I’m reading, Hello to the Cannibals, which also has letter writing at the core of the narrative. This class will take all types. Those who are tech-savvy, and those who still carry around those bricks people affectionately refer to as “Nokias.” Those who know how to code, and those who can barely form a proper sentence. And that’s okay. The hope is by the end of the class, you’ll find something, no matter how small, you can attach to and find what interests you in this honestly intimidating field. Once you find that thing, run with it and run far. You’ll have the freedom to really make this class work for you, if you want it to…I also thought I wouldn’t be using any of these tools after the semester ended. After all, they looked really cool, but how could I integrate them into my own studies? In this case, desperation is both the mother and father of invention. As work in my other classes became more involving and complicated, I realized I could unravel some of that complexity with some of the practices I learned from this class. Even if there isn’t a specific tool that you find particularly helpful, the concepts of critical thought, deconstruction, and distant reading will be universally helpful to you. What I am taking away from this class more than anything is a new way of looking at , and questioning, our digital world. Why do our screens have to be rectangular? What does that do to our thinking? Why do our presentations needs to be composed of slides? What does that do to our thinking? Why do we only watch one video at a time? What does that do our thinking? Are these the only ways? These are questions I wasn’t asking before, but I am now. This post originally appeared on the Chapman Academics Blog. For quite some time I’ve used GoogleDrive to store my course materials. For me it is the easiest way to manage the many documents that I create during a semester, and the iterations of those documents as I update them each time I teach a class. To share these documents with my students I add them as hyperlinked content on Blackboard. However, this semester I had two unanticipated experiences from using GoogleDocs, which seemed worth sharing with others who are using this tool in the classroom. I created a folder in GoogleDrive for each of my students to store content related to their end-of-semester research projects. For example, I created a document called “Sources” in that folder where the students were required to upload the online links (or images of book covers) for their research sources, prior to completing their writing. By having their sources all in GDocs, I was able to peruse and comment on each one, to either validate it as an appropriate source or to suggest alternatives when the source did not match the students’ research question or the parameters of the assignment. I was surprised, however, as I was navigating through these GDocs, to find that many of the students were logged into the Docs at the same time that I was leaving my comments. This allowed us to virtually “chat” through the comment stream about their sources, and was a surprisingly informal and helpful way to offer suggestions and corrections for the students. In the future I intend to experiment with holding virtual office hours via GoogleDocs, which seems an excellent way to be available for conversation with my students during times that they might not be on campus or I might not be near my office phone. I discovered about halfway through the semester that in one of my classes where I created and linked to the stored syllabus in GoogleDocs, that they students were “chatting” on the syllabus page during class about the course material that I was presenting in class. At first I was taken aback and uncomfortable with knowing this–were they not paying attention in class and instead chatting with each other virtually, becoming something like a class snapchat account? But then I realized that it was pretty ingenious of them to use this tool that I’d given them in a way that I’d not expected. In fact, one class session where I was at a conference and had scheduled a guest speaker for the class, I jumped into the syllabus document and chatted with the students while they were in class and I was at my conference hotel. I loved that I got to “check in” with them in the moment, virtually. Their candid responses to the speaker were also helpful to me–they said that they were learning a lot from him! This assuaged any guilt that I had for not being present that day and allowed me to feel better about what was occurring in my classroom. These experiences have cemented my interest in using GDocs in the classroom. In both intended and unintended ways, they are excellent tools for student collaboration of all kinds. Perhaps some of you have already noticed that I’ve been doing a bit of rearranging around here. As of a month ago, my site looked like the image above. 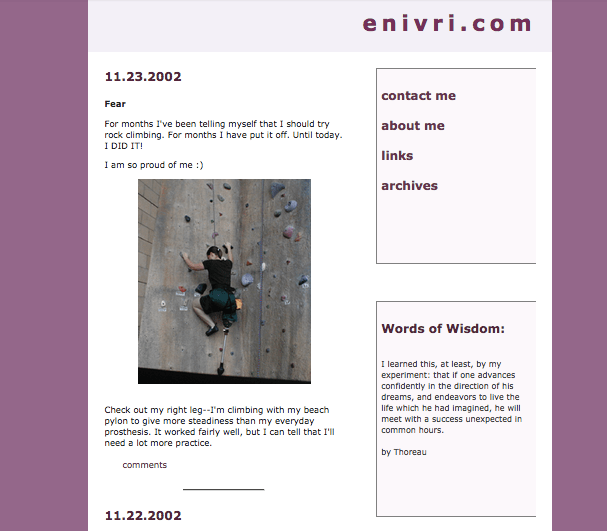 I loved this look for my site that I’ve had for the past seven years. The colors and simplicity of the design were so me. 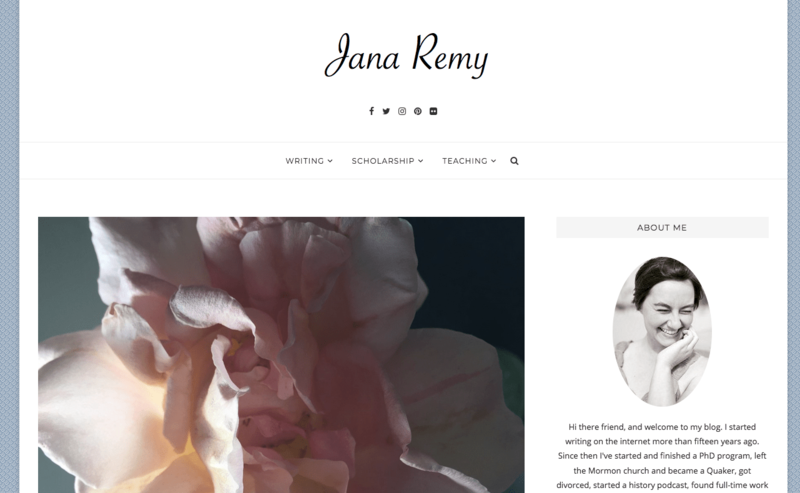 However under the hood the site was a pretty big mess–the design wasn’t responsive, the subpage links kept breaking, and the content was really hard to update due to the customization of WordPress necessary to support the visual layout. So I realized that it was time for it to go and to adopt a new look. 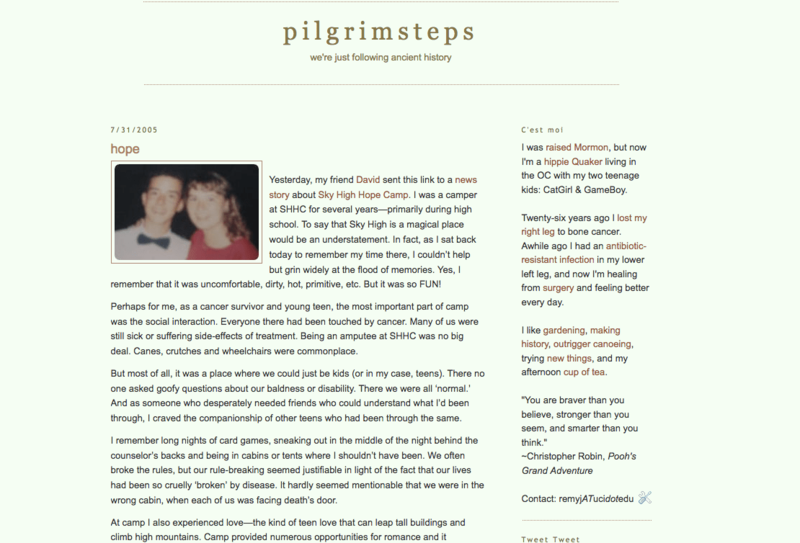 So I fussed around about it for awhile and came up with something super-simple, that resembles some of the former look of the “pilgrimsteps” blog from way back when. Some things never change, such as my love for light backgrounds, san-serif fonts, and images. But some things have changed so very very much in the past fifteen years. More than I can even begin to document. Fortunately I have a blog archive stretching back over all that time that I can peruse and marvel at all the roads I’ve traveled since then. And a link to an image showing my last visit to Louisa. After a few years of Stijn and I trying to co-habit in a shared office space, I realized a few weeks ago that it wasn’t working for me, that I needed my own space to write, one that had my own books, office supplies, piles of papers, houseplants, etcetera. I was nervous to tell him that I wanted to keep a separate space. I felt like, somehow, it was a signal that there was something amiss with our relationship. I waffled for a while about broaching the subject. And when I finally did, I was nervous that he would resist or feel betrayed. He didn’t. He was nonchalant, asked a few clarifying questions about shared resources, and wished me well. For many years I have worked and written from wherever I could plug-in my laptop, and I have done just fine. I wrote papers, authored blogposts, crafted technical documentation, and replied to emails all from wherever and whenever. It has worked and I have made do. But now it feels like such a luxury to be able to claim a room and to make it my own. And already I can feel the difference. Writing is easier than it has been in a very long time. Intellectual freedom depends upon material things. Poetry depends upon intellectual freedom. And women have always been poor, not for two hundred years merely, but from the beginning of time. Women have had less intellectual freedom than the sons of Athenian slaves. Women, then, have not had a dog’s chance of writing poetry. that is why I have laid so much stress on money and a room of one’s own. For those of you who followed along on the FBLive videos that we created in the Archive last summer, you will know that we left you hanging as to the outcome of the developing relationship between Florence and Wally. Specifically, you knew that they had plans to marry soon but also that Wally would “ship out” soon too, and we didn’t tell you which would happen first. Poor Florence, she hasn’t heard anything from Wally lately, she had to say goodbye to her brand new husband on a street corner as he shipped out for parts unknown-to-her, and she is struggling to make her holiday plans. 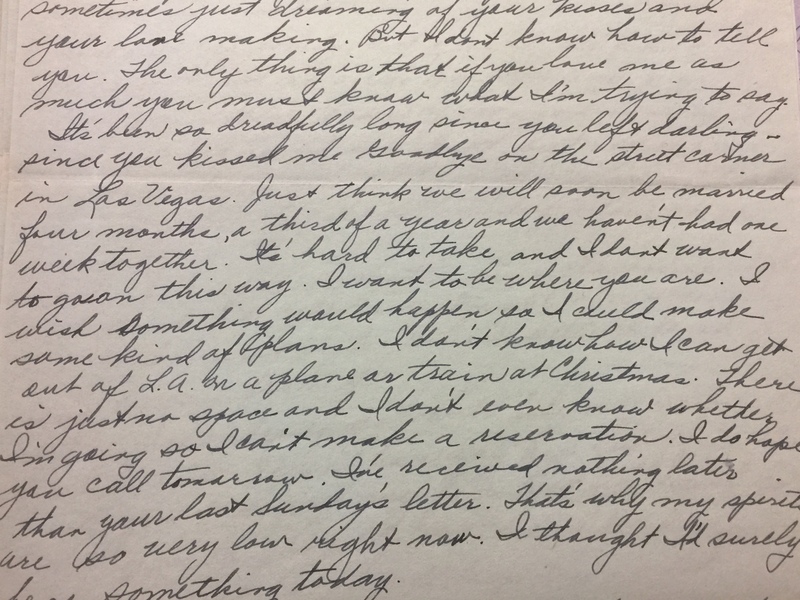 I felt so awful for her as I read this letter, perhaps even more so because it’s that same time of year that I’m also scheming about all of my own Christmas plans! So I’ll let you in on a secret to break a bit of the suspense. She gets her wish and Wally does come home for Christmas. And this time it’s not a furlough or a weekend break. He’s home for good.